Here is world-class poker training directly from Mike Caro’s acclaimed seminars. You’ll actually see the tips, concepts, tactics, and winning advice on blackboards and learn all the secrets explained clearly as only the “Mad Genius of Poker” can. Long-guarded trade secrets to poker success. How can you use seating position to extract maximum profit from opponents? Page 54. How does a pair on the board affect your hold ’em calling strategy? Page 100. Become motivated to win using Mike Caro methods that most players have never even thought about. How to adjust your strategy depending on whether you’re in a raked game, home game, or when you’re charged hourly for your seat. Page 73. Why a tight image when you’re actually playing tight will destroy your bankroll — and what to do about it. Page 175. In seven-card stud, how should you play a big buried pair with a small exposed card? Page 85. Hundreds of proven, powerful, big-money tips made easy for you to take straight to your next poker game! How to determine instantly if a game is profitable. Page 140. How do small stacks affect your tournament play? Page 154. 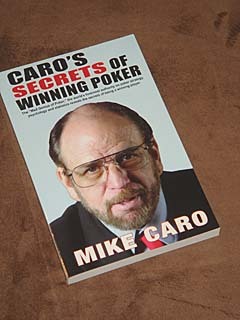 If you’ve never been able to attend a Mike Caro seminar in poker, here’s the book that brings you the drama of learning poker’s fastest money secrets without leaving your home.